Through all his wins and national championships, the true legacy of Coach Mike Krzyzewski of the Duke men’s basketball team is the number of players he coached who went on to become coaches and managers – and it all started with that 1986 team that came within a basket of winning their first national championship. That all came to mind last week during the first three rounds of March Madness when Harvard once again pulled a first round upset, then Stanford upset number two Kansas in the second round. Both teams were coached by Duke alumni who played in that 1986 championship game against Louisville. 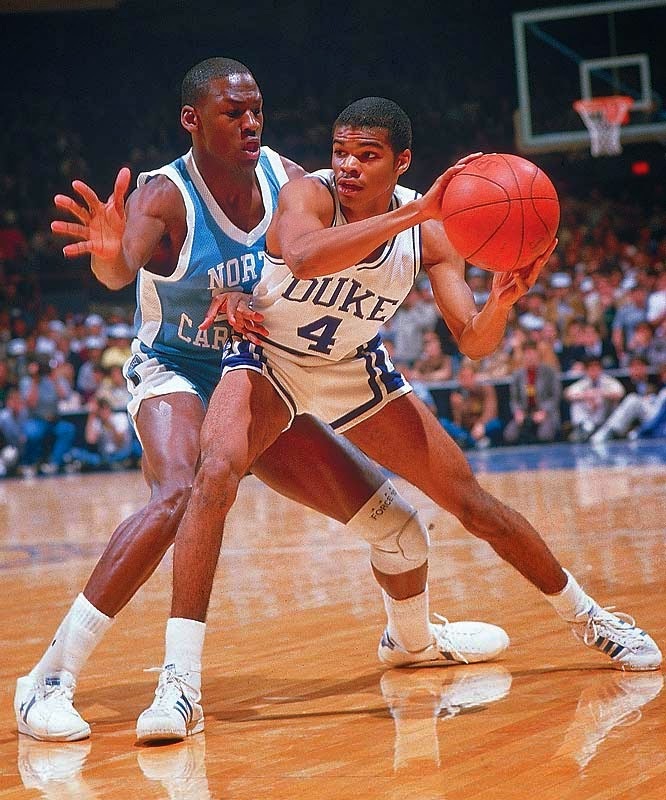 Duke forward Tommy Amaker in 1986. Duke guard Johnny Dawkins in 1986. Earlier that season, in the fall of 1985, I watched my first ever college basketball game. We were visiting my brother in Calgary, which always offered me the opportunity to escape peasant vision and watch cable TV. While my family went shopping, I stayed in the basement and flipped on the TV. There was a much hyped college basketball game that I had to watch. It featured two of the best teams at the time: the Duke Blue Devils and the Georgia Tech Yellow Jackets. Duke was led by Johnny Dawkins and Tommy Amaker and Mark Alarie and Danny Ferry, while Georgia Tech had guard Mark Price and forward Bruce Dalyrimple. I used to carry around a notebook to write down things I wanted to remember, mostly sports names and teams. I recall scribbling the rosters of both teams, which is probably why I still remember those names so easily. Duke won that game, and would go on to have a magical run to the championship, rated one of the best teams in the country. I followed them as much as I could without cable TV, a regular newspaper, or sports magazines. My best friend Chris Vining kept me in the loop too. Peasant vision carried no college basketball, so I had no chance to watch Johnny Dawkins lead his team into battle against Pervis Ellison and his Louisville Cardinals, who were coached by the legendary Denny Crumm. Instead, I recall hearing the news on that Monday night, on the late news, after I got home from my after-school job at Gergely’s Greenhouse. We had a black and white TV going at the greenhouse all day, so the next night, as I passed by, I saw the highlights of the national championship game and Duke’s heartbreaking three-point loss. I just could not believe Johnny Dawkins and company had lost. That Duke team set the stage for a program that would become a regular in the Final Four, advancing in 1988, 1989, 1990, 1991, and 1992, winning the championship those last two years. They would return again in 1994, losing to Arkansas for the national championship, and have since won two more titles in the 21st century. Dawkins would go on to play for San Antonio, Philadelphia, and Detroit in the NBA. When his playing days were done, he found a spot sitting beside Coach K on the Duke bench in 1998 as one of his assistants until 2008. He would eventually strike out on his own, coaching the Stanford Cardinal. His coaching career to date has culminated with his Stanford team’s upset of Kansas. Meanwhile Amaker coached Seton Hall, Michigan, and Harvard. Last year his Harvard squad shocked number three New Mexico and this year upset number five Cincinnati, before falling to number four Michigan State. Still, Amaker has brought a winning culture to Harvard, that may dominate the Ivy League for years to come. There were others too from that 1986 team, such as Quinn Snyder, who took Missouri to the tournament, Jay Bilas who was another assistant under Coach K, Danny Ferry who was in management with Cleveland, San Antonio, and Atlanta of the NBA, Billy King who is the GM of the NBA’s Brooklyn Nets, and David Henderson who was an assistant for Coach K before assuming the duties as head coach of the University of Delaware for six seasons. As for Coach K, he continues to patrol the sidelines for the Blue Devils. His team was upset in the first round by unheralded Mercer, but I hope he takes comfort in the fact the players he mentored into coaches have achieved their own success – and started by learning at his side. That’s the true quality of leadership.